Hello Friends, I am happy to share with you my “blueberry pie filling” quilting motif. Don’t the quilted pebbles look like blueberries nestling oh-so-snug in a pie crust? This motif illustrates another application of “pebbles”. Click here to read about how I quilt pebbles/circles. 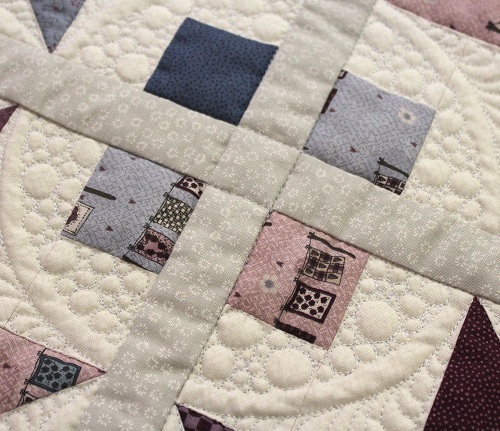 Click here to view the quilts on which I have quilted pebbles. 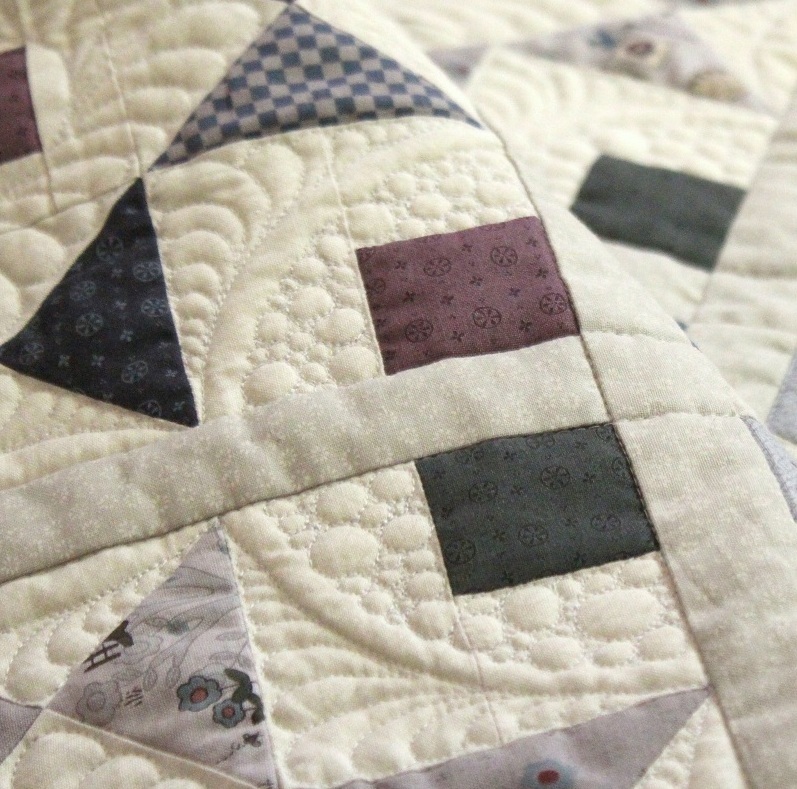 Click here for my “Learn to Machine Quilt” class (online or DVD) that covers how I quilt pebbles. I quilted “blueberry pie filling” on a recently completed quilt, Repetitions. It should already be at the editor’s by the time this post goes live. Here are a couple more sneaky peeks for you. Can you see the very light gray threads I used for quilting the quilt? 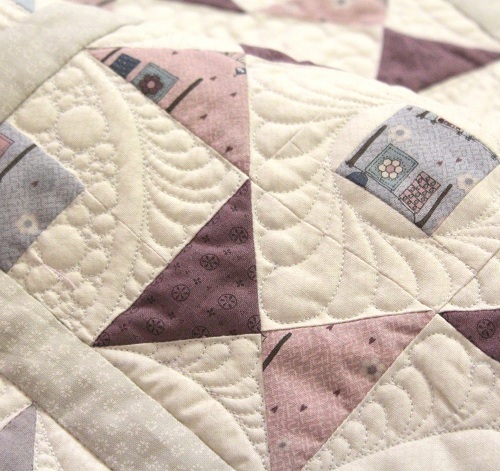 The quilt uses fabrics from an upcoming Lynette Anderson‘s fabric line Quilters Garden. 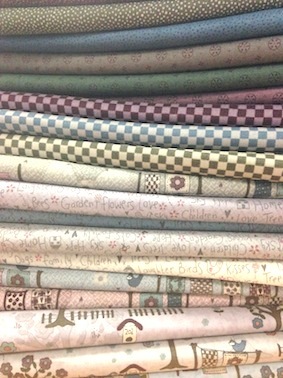 It is Lynette’s debut line with RJR Fabrics. I have MUCH more to share about Quilters Garden. Be sure to check back early next week for details! Thanks for stopping by. God’s blessings on you all! This entry was posted in Quilting, Quilts & Projects: Upcoming, Thread Talk and tagged Domestic Machine Quilting Tips, Wendy Sheppard. Bookmark the permalink. Love the color combos in your sneak peek! Mmmm that sound yum!! Pebbles are so versatile. Love the colors but more so the quilting! Good job! Aren’t “pebbles/blueberries” just the best for a contrast to feathers???? And yours are outstanding!!! Once again, a winner!!! Hugs………..
Those are great fabrics, Wendy. Your pebbles have always caught my eye in your quilting. The circles are so perfect and they really do enhance your work.